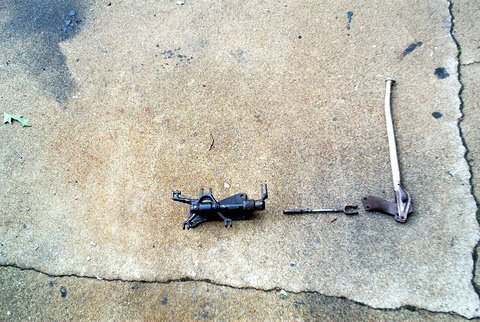 Hooking up a functional parking brake on a '35 - '36 Ford is quite easy, in fact it can be done for under $50. 1. Use the original brake handle and the original master brake cross brake mechanism which is bolted to the center frame box..
2. Connect the original brake handle to the master mechanism as normal with mechanical brake operation. 3. Buy a 3/8" redi-rod. This is a common threaded rod that is available at any hardware store. 4. 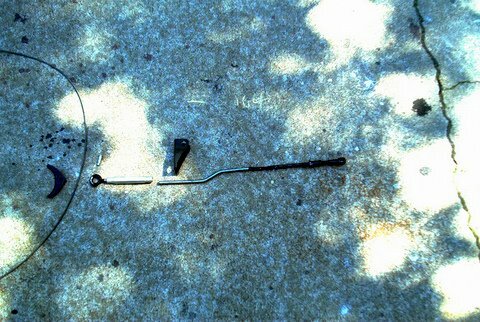 Use an "eye" clevis and attach it to the redi-rod. 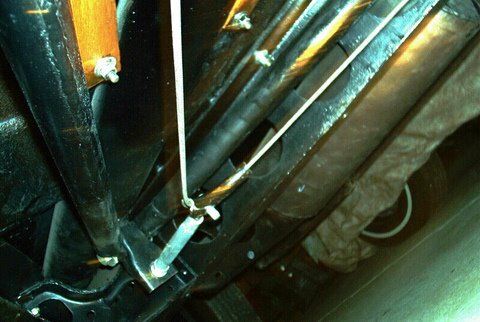 5, Using a pin, connect the clevis to the upper brake arms of the master cross shaft and run the rod to the back of the car. Note- on top of the master mechanism there are two upper arms you are going to center the redi-rod shaft between these arms. Attach the clevis to the arms with a pin or you can use a 5/16" bolt, drilled for a cotter pin. You will be using an existing hole in the frame for the rod so no drilling is required. If you note, I used a rubber hose to cover the redi-rod where it goes through the frame to deaden any vibrations or rattles. 6. Note the picture, I have a bend in the redi-rod. This bend places the rod in correct alignment to the rear brakes. It also allows me to use the '39-'48 emergency holder. 7. Use another "eye" clevis and pin. 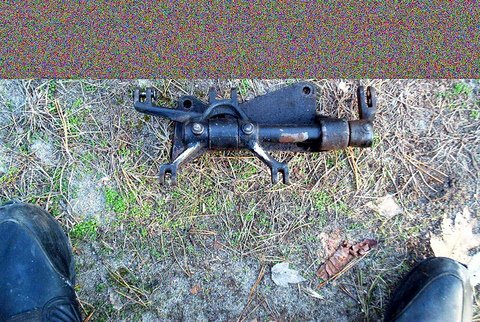 Attach a '39-'48 brake cable spreader. I used a turnbuckle to allow for "micro-adjusting.". The cable spreader is a common part carried by a lot of antique vendors. 8. You will need a '39 emergency cable. Again an easy to locate common part. 9. Hook the cable ends with the brake lever inside each drum. 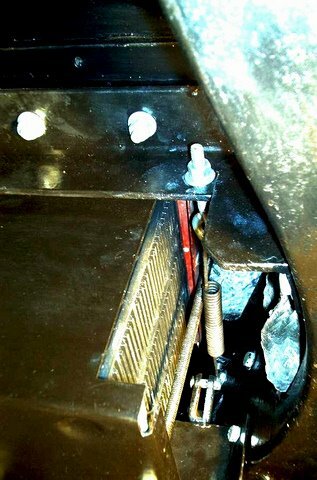 If you don't have the internal brake hardware, don't panic. The required parts are readily available. 10. The only thing remaining is a return spring for your emergency brake. 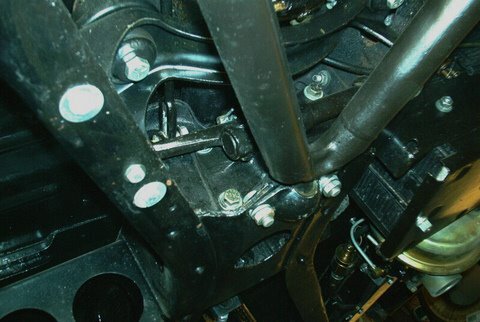 If you look at your master cross shaft you will see that one of the arms on the left side extends through the frame. 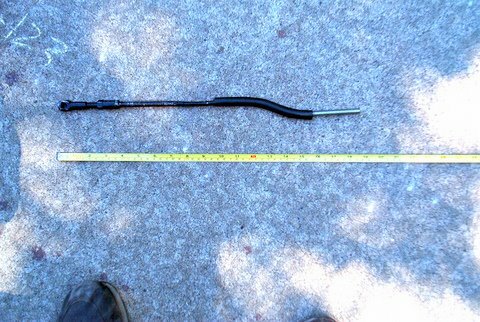 I added a coil spring and attached a threaded hook-bolt to the end of the spring. I then drilled a 3/8" hole in the battery crossmember (does not interfere with the battery) and added two nuts (one nut adjusts spring tension and the other provides for locking). 11. To prevent the cables from dropping and to keep them taught, I am using a couple of '39 cable holders attached to the rear wishbones. The holder is a common re-po part. When finished you will have a functional e-brake system that looks "factory!" As usual, I am open to any comments or suggestions.